13 ways to make your holidays affordable and meaningful. No matter how you celebrate the season, it can be a challenge to come up with money for gift-giving and seasonal festivities. Take a look below to find tricks to handle all those extra expenses for more joy over the holidays. Stop spending for a month. It seems impossible, but if you really cut expenses to the bone, you can set aside some savings. Pack your lunch for road trips, ban restaurants (even the casual ones), and embrace potlucks and BYOB for entertaining. Let your hair grow a few extra weeks, use the library for entertainment and make all of your own coffee. Buy the store brand, eat up everything in your freezer and avoid temptation by not going to any retailers other than the grocery store. Recycle electronics and earn rewards. Turn your old electronic devices, like cell phones, cameras, navigation units, computers, tablets and MP3 players, into cash or points you can use for gift cards. Check out MaxBack and RecycleBank for details. To top it off, the programs reuse and recycle your electronic equipment, reducing the 2 million tons that end up in landfills each year, according to the Environmental Protection Agency. Reuse wrapping paper and gifts. Having a holiday spot in your hall closet, or in a plastic bin downstairs, will encourage you to save and reuse wrapping paper and ribbon. Include any gifts you received that didn’t suit you, and look through your stash before you buy anything next year. Most seniors have all the stuff they need. What could be a better, more rewarding gift than another pair of slippers? Try a gift from the heart. Offer to take your loved one holiday shopping, whether that’s out to the mall or online. Carry on established cooking traditions, asking the senior to contribute where they are able. Arthritis could make gift wrapping painful. Schedule an afternoon, complete with hot chocolate and holiday music, to help get gifts ready to give. Many older adults have a hard time bending and reaching the stored holiday decorations, and putting them up can be next to impossible. Bring up the holiday box and let your loved one choose where things should go. String lights outside, and let the older adult know you’ll be happy to take them down when the holidays are over. Send out holiday greetings from your loved one, complete with a photo. A general email can serve the purpose well, although older friends may prefer a card in the mail. Reach out to those in need in your community. Your loved one could help in a soup kitchen or food bank, even if it’s to sit and sort. Whether or not an older adult has any religious affiliation, they may appreciate attending a service around the holidays. If you can afford it, hiring someone to help around the house or provide companionship is always most appreciated. It might be a neighborhood teen, an agency caregiver or a neighbor. They can sort through old photos together and take walks. A hired caregiver can do laundry, change the bed and complete other tasks that would otherwise take away from quality time you could spend with your loved one. Move the holiday celebration. Retailers know you need to have presents when Christmas, Hanukkah or Kwanzaa rolls around. So celebrate a week later, and take advantage of all the sales. You can pick up a tree a few days before the holiday for half price, and stores save their biggest discounts for after the holidays have passed. Use credit card rewards. If you have good credit and pay off your cards every month, it’s possible to use a money-back card for needed purchases during the year to earn gifts. Look for a card that offers the best deal, such as Capitol One’s Quicksilver that offers a signup bonus and 1.5 percent back. However, this only works if you pay off the card’s total amount on time every month. You can set up automatic payments from a bank account to avoid a penalty. If past years have been problematic, pay cash. For some, a credit card is nothing but temptation. If that sounds like you, do a cash-only holiday. Set a limit, withdraw the cash, and when the money is gone, your holiday spending is over. Plan far ahead. Running out for a last-minute gift can really cost you. Give yourself plenty of time and make a list of who is getting a gift, what it is and where you can find it cheapest. If you are ordering presents, do it in plenty of time to avoid costly expedited shipping fees. Start shopping for next year after the holidays, when many items are available at deep discounts, and look for gifts when they are out-of-season, such as buying a bird feeder in the fall. Send e-cards instead of mailing paper cards. Send free e-cards, such as these from Blue Mountain. This saves the price of a card and envelope, plus postage, not to mention the time spent writing the address. Remember that words and gestures mean more. Especially for adult friends, the last thing they may want is another thing to store. Give a poem, a small painting or a pair of dice (life’s a gamble, after all). Find treasure at thrift stores. You can’t have a specific item in mind, but thrift stores can be a gift and decorating wonderland. Look for toys, coats, sweaters, jewelry and household goods. For bigger bargains, many have half-price days listed on the store’s online calendar. If you really enjoy the hunt, try Goodwill Outlet World locations, where items come out in huge bins and payment is by the pound. Try eBay. If you’re in the market for a collectible, using eBay can get around the hassle of schlepping from thrift store to thrift store, looking for just the right purchase at just the right price. The iconic online retailer offers a vast array of new and used items, and makes shipping to out-of-town destinations a breeze. Factor in shipping. When you’re shopping online, don’t forget to budget for shipping costs. If you have a list of items you’re looking for, you can often take advantage of free shipping over a certain amount by getting several items from one site. 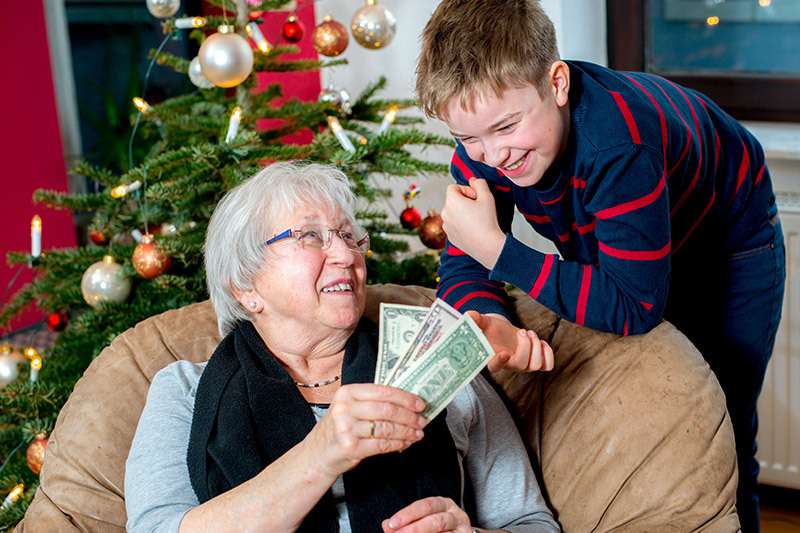 “7 uncommon ways to save for the holidays,” Bankrate.com. “14 ways to save money during the holidays,” Bankrate.com. “How to keep your holiday spending on budget,” Better Money Habits, Bank of America.